It’s a while since I’ve focussed on Basque and I’ve been wanting to do this run-through of coursebooks for learning Basque for quite a while. If you’re a regular on the site, you may recall that two summers ago I spent a month on an intensive Basque course and I’ve been learning the language on and off for nearly five years. I’m now at an intermediate level. There aren’t many Basque textbooks out there, so I’ve tried to cover all those that I know of and to give a personal view of the pros and cons of the ones I’ve used. There’s a short section on online courses and apps. I haven’t made much use of these, but I’m keeping a watching brief. Any books I’ve missed will also be added as I hear of them. This is one of the most accessible courses for English speakers. It’s part of the well-known Colloquials series, which are intended primarily for adult self-study. Each of the twelve chapter starts with a short conversation and then there’s at least one more conversation later on in the chapter (sometimes two). Throughout the book, the conversations follow the experiences of Elin, who – in a nice touch – is a Welsh woman, visiting the Basque Country for the first time. The conversations are a spring-board for the other sections of a chapter. There are then various other sections in each chapter, taking different approaches to teaching the language. So, “Grammatical nuts and bolts” and “Saying what you mean” focus on structures. That said, the book does not wear the grammar on its sleeve. Grammar points are pulled out of the conversational context. Back to chapter structure: “Doing things with words covers” functions such as expressing likes and dislikes, getting people to do things, making plans, expressing emotion. “Strategies for communication” deals with typical things to say in common situations. Two aspects I like are the “Talking about” sections, which present thematic vocabulary and the “Language and life” sections which are packed with information (inevitably in some aspects a bit dated but still highly revealing) and relevant vocab, with different themes presented in different chapters. Exercises interspersed throughout but, for me, not nearly enough of them. That said, you can make your own, of course (for example by copying out the conversations leaving gaps, translating the conversations back and forth….). One issue that arises when you start is which form of Basque should you learn? Dialectical differences are no bigger than in any other language (such as English) and are generally no obstacle to mutual understanding. We’re not talking the differences you get within a language like Arabic here. That said, a standard written and spoken form (“Euskara Batua” or Unified Basque) has only been developed since the 1960s and it’s this that is usually taught. The authors explain that the language presented is “a compromise between the slightly stilted modern spoken standard and the colloquial Basque that ordinary people actually speak”. Some of the possible variations are introduced, including in the audio. Yes, a great plus is that this is a course with audio. As with all the Colloquials, the audio is now available free online (or, viewed from another perspective, priced into the book). The core of the audio – to my mind the most useful aspect are the recordings of the conversations. As with other Colloquials I’ve used, I’m not sure how much the additional audio exercises really help, but they can’t do any harm. There are too few of them to make a difference. With the old Colloquials CDs they used to really complicate navigating the audio, too. The subtitle of the book – “The Complete Language Course” – is misleading. It is not a comprehensive map of even the most common features of the language (for that, see King’s other book, below). For example, Basque relative clauses are very different from English. Whereas we’d say “the bus which came yesterday” the say “the yesterday came bus”. The different order takes practice. This structure only comes up in the last chapter, where there is the briefest of explanations and no exercises. The same is true of the simple past of synthetic verbs, where only three are given (to be, have, know), though there are three other very high-frequency ones (come, go, move). I presume some of the limitations in coverage are due to constraints from the publishers: the book is a mere 246 pages. This does not compare well with other languages in the Colloquials series for which the market can hardly be larger: Colloquial Icelandic 398 pages. Catalan 20 chapters, 290 pages. Serbian 376 pages. The Assimil course has the same problem (see below). All in all, if you want to feel you’re getting systematic thoroughness and more-or-less the whole lingo laid out before you, you won’t be so comfortable with the book. If, on the other hand, you like a practical course which only presents as much grammar as you really need to get going with basic communication, and does so in context, this is a great book for you. If you had an active command of all the language in this book, you’d have a great practical base and would be able to “work your way” round expressing ideas that you don’t yet have the grammar to express. One minor note: the chapters are long (the material could easily been sliced and diced to make, say, sixteen chapters). If you’re the sort of person who likes to try to cover “a chapter a week” or whatever, you could easily split one in two. In any case, my experience with working through any textbook has always been I move ahead and double back, many times before it starts to sink in. The other English-medium “introductory” Basque textbook option (which I haven’t used) is Wim Jansen’s Beginners Basque from Hippocrene (looks like there’s a new edition coming out later in 2018). A problem you quickly come up against when starting Basque is that most of the beginners’ learning materials are either in French or Spanish (or German, there’s always something in German!). I’m a great fan of the Assimil “Sans peine” (“with ease”) series, so I got myself a copy of Le Basque unifié very early on. The audio is sold separately and I’ve spent huge amount of time over the last three years listening to the audio over and over again as I jog. Whereas Colloquials have more author flexibility in chapter structure, Assimil “Sans peine” follow a standard format, regardless of language. The aim is to present structures with minimum vocabulary. There’s never a systematic presentation of high-frequency vocab or major subject/communicative-situational areas. Each chapter starts with a short conversation. It’s in the target language on the left-hand page and in translation on the right. New points of grammar, vocab and cultural observations are in short footnotes. The first half of the book is what Assimil call the “passive phase”. The focus is on understanding the Basque text, relying on the French translation to check your comprehension. There are some translation and fill the gaps exercises at the end (usually a miserly five of each). Every seventh lesson is a review lesson. I think the summary overviews, particular of the verbs, work better than in Colloquial Basque, because they explain how the system works. In the second, “active phase” the format continues as before. As you move from new chapter to new chapter, however, you’re now also supposed to repeat lessons from the first half of the book. This time, you’re supposed to translate the conversations from the first half of the book from French into Basque. As the title suggests, the language taught is Unified Basque. There is also a one-page (!) summary of five features of the language as spoken in the French Pays Basque. Lots of dedicated language learners love Assimil, though I’ve never yet met one who limits themselves to use books according to the “Assimil method” alone. They tend to modify how they use it and to combine it with other sources and lots of passive and active exposure (which is pretty good advice in relation to any textbook). That’s how I’ve used it. I have two specific criticisms of this particular volume. The first (as with Colloquial Basque) is that it doesn’t cover the whole language. It leaves you hanging, your head spinning with known unknowns but clueless about what unknown unknowns might be out there. The limited coverage has to be the fault of the publishers. The authors only get 377 page (50 lessons). Finnish (German edition) 459 (100 chapters), Swahili (French) 523 pages (100 lessons), Hungarian 394 (59 lessons). I thought maybe the publishers didn’t have their heart in what are patronisingly known in their own Vulgar Latin patois as “Langues regionelles”. The slimline volume for Corsican 384 pages (77 lessons) pages) would support this. But Assimil Breton weighs in at 540 pages (100 lessons). I’d venture that in terms of the size of the market, the northern Basque Country (the French “Pays Basque”) is at least as large as in Brittany. It’s a bit of a mystery. There are two key omissions if you really want to finish the book feeling that you’ve been “initiated” (and which a few extra chapters would have enabled the authors to cover). These are the nori-nork (subject/indirect object verb forms and some treatment of hypotheticals, conditionals and potentials (some of which are introduced in Colloquial Basque). In real life, you hear some of them a lot, for example in restaurants or when shopping (I would like to have, might I have etc…). The second criticism is the fault of the authors. Assimil doesn’t follow the common “situational” approach. Still, the vocab used sometimes seems wilfully obscure. For example Unit 31 “Aterki elefanteduna” (an “elephant-emblazoned” umbrella) involves a gift of an umbrella with a picture of an elephant on it. The point is to shoe-horn in some grammar. At least in Chapter 31 the point is clear. Chapters 38 and 39, in contrast, are about the history of witches in the Basque mountains. I can see the sense of conveying some history and culture but is it really fair to present us with sentences such as “The sabbaths, the witches’ assemblies, continued in the caverns of Zagarrarmurdi until the seventeenth century”? (p 213). Perhaps the “initiation” of the volume’s title is actually a reference to black magic 😉 . But, seriously, here, we’re moving way beyond “the pen of my aunt” territory into full “my hovercraft is full of eels” obscurity mode (for the record: “Nire aerolabaingailua aingirz bateta dago”). Still, I have to admit that all this background did spice up my visit to the history and myth-rich Aralar mountains when I was in the Basque country (check out the “out and about” vlog). Another example of less-than-helpful content is that in the dear old elephantine chapter. One of our heroes is supposed to be bringing Pantxi’s “dizkoak” (vinyl records) down to the Basque Country from Paris. One sentence involving said discs illustrates the second person singular subject/present tense/plural direct object/first person singular indirect object verbal auxiliary (“dizkidazu” – obviously). Here goes: “Eta Pantxikaren diskoak, ekarri al dizkidazu?” (p. 165). “Eta Pantixkaren liburuak, ekarri al dizkidazu“. Why choose an object which sound so like several of the verbal auxiliaries? 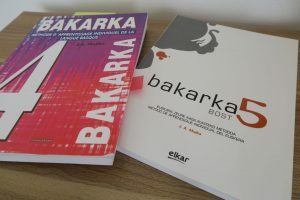 Bakaraka is a coursebook for Basque in five volumes from the Elkar publishing house (who have a great bookshop in Bilbo). The series is aimed specifically at people studying on their own. The first three books in the series have audio. The books come in Spanish or French versions (books four and five in French are only available in the “old form” (which seems to be a matter of design only, we’re not talking about substantively different editions). Books 1 to 3 cover the elementary levels on the Common European Framework of Reference for Languages (levels A1 and A2). The “higher levels”, as the blurb on the back puts it, are covered in 4 and 5. I have worked diligently though volume 1 of the French version. The audio recordings for the French version have “northerners” speaking. Their pronunciation is French influenced (as much of the phonology in the south is influenced by Spanish), plus there are some northern peculiarities that seem independent of French (such as the pronunciation of the “h” like in English – not found in southern Basque, French or Spanish). I did not use volumes 2 and 3 but now I’m working through book 4. Book 5 is on my shelf for when I’m ready for all those past conditionals and the subjunctive case. For Level 1, you begin with grammatical explanations with simple black-and white illustrations. The rest of each chapter is made up of short conversational dialogues (also on the audio), a passage for reading and a huge number of exercises. The topics and scenarios are not “situational”, though they feel down-to-earth and useful (and are focussed on everyday, high frequency words). The exercises include questions on the reading passage, practice filling in missing auxiliary verbs and case endings (hugely important in Basque) and translation from French (or Spanish) into Basque. For some, the approach may seem laboured. To be less diplomatic,the word I picked up on the street during my month on the Maizpide residential course, was that the series is a bit “boring”. I think that’s unfair (but, then, I have a high boredom threshold). The huge number of exercises may feel like overkill to some learners. To me, though, they sit quite well with such a “grammar-heavy” language. There are a lot of strange forms that are quite regular and easy once you get used to them, but they do need a lot of practice. The number of exercises (all with answers), means that you’ll always have something you can be doing between lessons and, of course, you can do some of the exercises orally with a teacher. The audio is sold separately. It’s extra expense but quite usual in the market, I have to admit. There is no audio for books 4 and 5. This isn’t such a draw-back, as if you still need it at this level, you need to double back a long way. Whether Bakarka is for you is going to come down to a matter of taste. If you work through all five volumes, you’ll have covered substantially the “whole” language, though. There are only two other books I’ve come across that offer you that. The multi-volume Arian (lower levels have Spanish as the medium of instruction, the higher ones are in Basque only)(see below) and King’s The Basque Language, to which we will now turn. Enter the sacred text(book) of Basque for English-speaking learners. Each chapter contains a colloquial conversational text or two, with new vocab is presented. There are quite full grammatical explanations, including grids to practise generating your own sentences. Each chapter also has a good number of exercises. Not all have answers included at the back, but many of them do (a prerequisite for me in a language textbook). There are 40 chapters, including, at five staging post “review chapters” in the first half of the book. After the units there is a 15 page “Elementary reader”, including notes. Students are directed to these texts for additional practise at various points earlier in the book. The additional material is useful to have and would have been even more valuable in pre-internet days (the book was published in 1994) when learners didn’t have instant access to all manner of texts online and the ability to order more at the click of a button. There is an 80 page reference section at the back which is clear and comprehensive (though you need to know your grammatical terms). It would be worth getting for the reference section alone once you’re at intermediate level. There’s an excellent index, so it’s great for looking things up. There is also a lot of information on dialectical variations. One of the characters speaks Biskaian and there is a trip to the “north”. For me, that means it’s “game off” for the first stages of self study, unless you work with a tutor or native speaker (and maybe get them to record the texts for you). I acquired my copy about a year into my Basque journey and worked through the first half for revision (before getting to structures I hadn’t previously covered). Arian is your classic, vibrant and modern textbook. I’m including it here for completeness, though I haven’t used it myself, yet. So far as I can tell, the language of instruction at the lower levels is Spanish (a language I haven’t yet studied). It can be used either as a class textbook or for self-study (there are exercises with answers). There are multiple volumes by level, using the Common European Framework of Reference for Language Scale, subdivided. You can get Volume A1.1, A1.2, A2.1, A.2.2 and so on up to B2.2 (what we might call upper, upper intermediate). Each volume also comes with two brochures (transcripts of the audio and answers to the written exercises). At additional cost, there’s a CD with each level. Then, separately, there’s a “workbook” with a brochure of answers. According to the publishers’ blurb, the A1.1 volume has seven chapters, each organised around three different communicative situations, trying to use a fairly natural register. If you worked through all the volumes (a task of several years), you’d have tons of useful material and a lot of chance to practise and consolidate. You’ll also cover all the structures. But, your pocket would suffer as much as the rain forests. A coursebook/CD combo is Euro 23-ish and the workbook is Euros 12 – 14. If you got the full lot, we’re looking north of 200 Euros. I’ve got the full package for level B2.1, but haven’t used it to date. Another elementary course published by is Primeran! (A1 and A2 levels)(Elhuyar/Habe/AEK 2015) which I don’t yet know. I assume that the language of instruction is Spanish. Le Basque pour les nuls. Guide de Conversation by Jean-Baptiste Coyos and Jasone Salaberria-Fuldain, second ed. 2016). This is in the French version of the well-known “For Dummies” series. This looks like a glorified phrasebook (that’s not meant pejoratively: many learners like to start with just this sort of thing). Speaking of phrase books with knobs on, if you speak German you could also try Baskisch Wort für Wort in the always-fun “Kauderwelsch” series. There’s a separately sold CD as well. The full-blown option in German is Lehrbuch der baskische Sprache by Juan Antonio Letamendia and Christiane Bendel (Buske, 2009). This comes with a CD. Bendel has also written a related (but free-standing) grammar books: Baskische Grammatik (Buske Verlag, 2006). To judge from the reviews on Amazon, this is not a volume for the casually interested. I’ve also made extensive use of the books produced by HABE. These materials are made available by HABE to teaching centres and were drip-fed to us as handouts when I was on the Basque courses offered by the London Basque Society. There’s also some audio. I like them, but, unfortunately, they don’t seem to be publicly available. There are also online resources and apps….but I haven’t made much use of them. There’s some material on Memrise. There’s a discussion on Duolingo. If you’re a beginner, my recommendation would be to combine Assimil (if you can do French) or Colloquial with either King or Bakarka. For those who read Spanish, the other obvious option would be to start with Arian 1.1. If you enjoy the language and decide to go further, you can either then switch to King or re-mortgage the house to keep going with Arian. If you’re still with me at the end of this post, I’d place a bet on you being…or about to become….a Basque learner. So, now it’s your turn. Have you used any of the books above. Have I missed any out? Let me know in the comments below! Eskerrik asko! Not a student of Basque, but a former resident of the “other” Basque homeland: northern Nevada, USA. Scattered across that area, and extending into neighboring states, are vestiges of the Basque subculture of the old American West. Many Basque men came to the intermountain West to work as sheepherders. Basque restaurants in towns such as Gardnerville, Reno, Winnemucca, and Elko are what remains of the network of Basque boardinghouses, which were located near major railroad stops in the West. I remember a bar in Gardnerville, where old men spoke Basque while they drank picon punch and played board games. A large shield on the wall said “Zazpiak Bat.” The tradition lives on: Boise State and Univ. of Nevada Reno offer degrees in Basque studies. Thank you for your posting and good luck with your study of a unique language. Thanks, Brad! Very interesting. I’d heard about the Basques in Nevada but didn’t know why they’d gone out there in the first place.